Today’s episode is hosted by assistant editor Alexis Goble. This is the place of the carnivores, the pool ringed with sundews and the fat funnels of the pitcher plants. This is the place where the ground never dries out and the loblolly pines grow stunted, where the soil is poor and the plants turn to other means of feeding themselves. This is the place where the hairstreak butterflies flow sleekly through the air and you can hear insect feet drumming inside the bowl of the pitcher plants. From the author: Pocosins are a type of raised peat wetland found almost exclusively in the Carolinas. 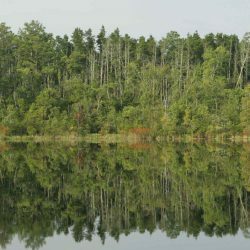 The name derives from an Eastern Algonquian word meaning “swamp on a hill.” They are a rare and unique ecosystem, today widely threatened by development.